As per popular request here's a close up of the Lacour's that Mike & Shawn uncovered last week. Sure looks like a beautiful medium to lighter amber variant three to me. Once again Congratulations guys! 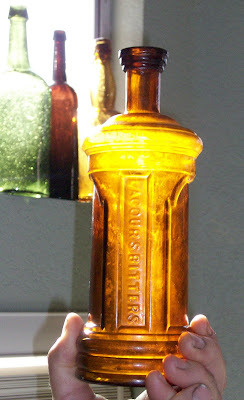 Once you get a closer pic, it is a variant 3 Lacour's bitters. Good timing, this saves me a trip tonight to the bottle club meeting to view it up close. Why would you only attend the meeting to see the Lacour's? Without member's presence we have no club. There aren't many meetings where a good bitters is brought to for show and tell, and that's where my interests lie. Almost makes me feel like I'm no longer worthy to weild a shovel. Someday I'd sure love to dig a true classic western bitters like a Lacour's or Dr. Wonser's. What a killer bottle. Warren, do you have a count of "Big Dig" versus non-"Big Dig" results for bottles like the Lacour's, AT & Co's, Bryant's cone, etc. It seems a few diggers were able to find in the Big Dig, what others won't come close to over an entire lifetime of pretty consistent digging....Food for thought, eh? The S.F. '98 dig was certainly a very pivotal and historic event in antique bottle collecting. The two most notable finds from that dig in my mind were the A T & Co and V. Squarza examples unearthed. Up until that momentious event only 1 example of each had been known and those were both found over twenty-five years earlier and little if anything had been researched on the history of the bottle itself back then. 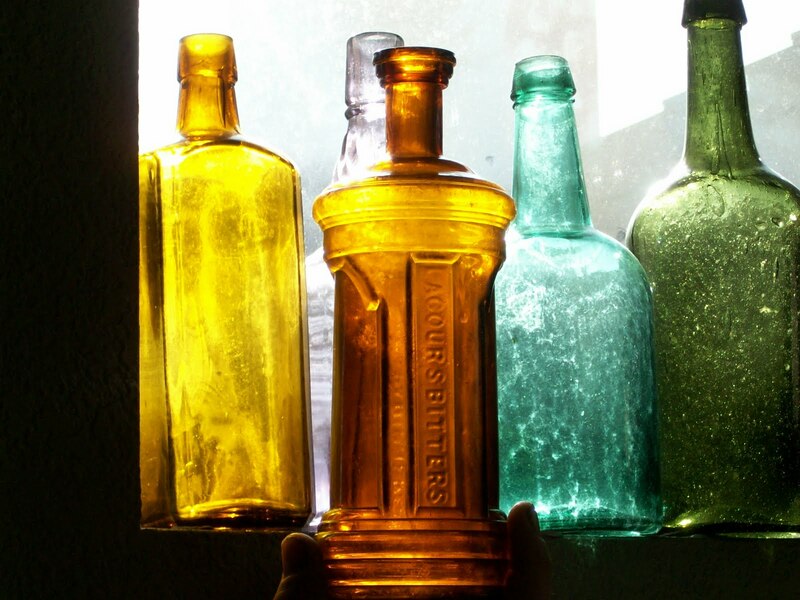 There have been other digging sites that have produced an incredible amount of quality or quantitiy of desireable bottles for the collecting community as well. What comes to mind is the excavated site in NV where approximately 18 Wormser barrels were found, or the privy site where approximately 25 very good globby whiskeys were found. All of the S.F. embarcadero digs where most of the very early sodas were found. As far as sheer quantity of bottles as well as variety of bottles found, the S.F. '98 dig will probably never be surpassed. From talking with the diggers of that site, well over 8,000 bottles were taken off that lot. As far as a count of quality bitters from the S.F.dig versus elsewhere,there may have been more in quantity at this location, however a great many of these bottles were broken. Several diggers unearthed groups of Cassin's only to be found whole but broken in place probably by the compaction of the soil due to heavy machinery. Another astounding find were the number of great Eastern bitters that had been gathered up and were luckily unearthed, such as the variety of barrel bitters and oddly shaped bottles like Curtis Calasaya Cordials or Bryant Stomach Bitters. Indeed it could be considered "the dig of the century." Hey JF. Location,location,location. You'd also be digging the occasional western biters if lived in Gold Country. Don't feel bad, you're in SD for gods sake !!!!!!!!!! Will you be addressing the issue of recycling in the book ? That's pretty funny you digging a Bowman Jewel in Dago. I dug an A. Fortlouis in Sierra City. It was sold in one of the Glassworks "Western Roundup" auctions back in about 93 or so. Have never even seen pieces of one since. How about a run of puce, clear, green, and amber Lacour's ? Imagine that ! ! ! Does anyone have a count (broken or whole) on puce and clear examples ? Well, not directly; but the subject is talked of in several places in the book. I also include advertisements that have to do with bottle recyling. So you bought those tapes, I was the underbidder, also forgot and check on bids just after the time expired. One of the most alluring things about the Lacours that I like is the wide variety of colors they come in. In fact there's more color variation on this bottle than any other Western bitters. I've personally seen whole and broken examples in shades of aqua, ambers, olive, puce, various shades of green and even clear. As far as the clear flint glass goes I think there's only one known and I've seen shards of one other. I have "Western Round-Up" tapes if anyone is interested. I have been fortunate to dig two perfect Lacour's, here in River City. One pale green, the other light yellow amber. Both sold for the princely sum of $1200. Of course, that was back in the "olden days", when "the roof" hadn't been raised on Western bottles. Hopefully, it might happen again. We keep movin' dirt, but, so far, to no avail.